the monkey chewed tobacco on the streetcar line. and we all went to heaven in a little row boat. then you would have a key to the universe. over the whole land until the ninth hour. my God, why hast thou forsaken me?" New studies indicate that the Solfeggio Frequencies produce a "DNA healing" (see links below). This is apparently related to an expected "DNA repair," that will come with the earth changes. My studies indicate that a major effect of this "repair" will be a great improvement in psychic abilities, like having a new, clear "cell phone" on a multi-dimensional mental level. The number 528 relates to 5280 feet in a mile. The number 396 relates to 3960 miles, the radius of the Earth. The diameter of the Earth can be expressed as (11 + 11) x 360 = 7920 miles. The word Gematria means measuring the Earth. In some traditions, the Earth "mirrors" the "Heavens." The central "C" note of 528 cps can be calculated based on standard 440 cps tuning of the central "A" note on the piano. The number sequence 3, 6, 9 appears in various amazing forms, sometimes as a "skip sequence," or "gap space pattern." Marko Rodin found such a pattern in the reduced values of the numerological binary doubling sequence (example: 64 reduces to 6 + 4 = 10 and then 1 + 0 = 1). In the main table below, this is found as the Solfeggio number 396 and its mirror, 693. Marko also found a connection to the "I Ching" Timewave work of Terence McKenna, which involves the difference with mirror images. Prehistoric constructors obviously had a knowledge of the planets that had been passed down to them from even more ancient times (see Otto Apelt's Translation of Plato's Timaeus, Leipzig 1919). With their help, the three-dimensional relationships were explained, while the Zodiac served to show the course of time. The basis was the supposed agreement of the musical seven-step scale and the "seven" of the then-known planets, including the sun and moon. From this interval, the equation 2 x 3 x 8 x 8 = 384 was determined. Surprisingly, the distance between moon and Earth is 384,000 kilometers; the 384 in a relationship of 1 : 1000. Gary Val Tenuta has found this same pattern in alphanumerics of the English words for the numbers one through nine. Long ago it was noted that one-seventh (1/7) produces a decimal number that contains all the numbers except 3, 6, and 9. Interestingly, the number 285, one of the Solfeggio numbers is within the sequence 142857. The remaing numbers, other than 285 are 1, 4, and 7. Puting the three together in mirror form produces 741, another Solfeggio number. The numbers "skipped" can be read as 963, the third type Solfeggio number. The primary table of numbers, below, are listed with the larger number (n1) first and the smaller number (n2) second. The value of the square of the larger number (n1^2) is listed, followed by the value of the square of the smaller number (n2^2). The smaller squared value is then subtracted from the larger squared value (n1^2-n2^2 ), and the result displayed. The prime factors of this result are given. A "Key Divisor" is then figured and displayed, and finally, the "Solfeggio" related number , if any, is placed in the last column. Numbers in the final column include 396, which is a "true" Solfeggio number. Another number in that column is 693, which is the mirror of 396, and therefore is "related" in that way. By far the most common number appearing in that column is 297. This is the mirror of 792, which is twice 396. A red asterisk (*) is placed next to all the "Gematrian Numbers" -- which are all divisible by the number 36. A blue asterisk (*) is placed next to every true Solfeggio Number. I find it quite remarkable that our simple numbers reveal these ancient Earth/Music/DNA/Metrological -related, numbers in this strange square-mirror fashion. I call them Creation Numbers. All 36 of the basic results (n1^2-n2^2 column) are divisible by 3, 9, and 11. The difference of mirror pair 32 and 23 results in 495. This is the first in the list that is not divisible by either 297, 396, or 693. The mirror of 495 is 594, which is 2 x 297. The number difference for the mirror pair 83 and 38 results in 5445 which can be expressed as 11 x 495, which puts the pair in the same category as the 32 and 23 mirror pair above. The number difference for the mirror pair 94 and 49 results in 6435, which can be expressed as 12 x 495, which is the third of this "495 type." Interestingly, 5 and 13 are related to the octaves, recognized on the piano keyboard as the 8 white keys and 5 black keys in each octave, for a total of 13 keys. The numbers 3, 5, and 8 are part of the Fibonacci series of numbers. The number 666 is "between" two Gematrian numbers, 648 and 684. The number difference for the squares of the mirror pair 62 and 26 results in 3168. The same is true of the mirror pair 97and 79. In Greek Gematria, the number 3168 is "Lord Jesus Christ." Ten times 3168 is the sub-lunar distance around the New Jerusalem. The image here is shown "upside down" from the normal view with North upward, to make the 5, 2, 8 more clear. The long parallel lines point northwest to Giza and southeast to Easter Island. Each corner of of the two triangles has 3 angels of 60 degrees, for a total of 360 degrees. Dividing 17280 by 3 (the corners of a triangle) gives the Longitude, 51840. The above information is included in Carl's "The Code 2000 - 4" which can be purchased at the Pyramid Matrix Bookstore. Crop Circle Correlates To Grek-5 Numerical Pyramid! Where Did the Timewave Come From? After rereading the above paragraphs, another idea struck me. A key number in the New Jerusalem Plan (or design) is 31680 miles. This is figured in two ways. Draw a box around the sphere of the Earth, which has a diameter of 7920 miles. The perimeter of the box is 4 x 7920 = 31680. The second way is to calculate the circumference of the circle in the diagram (above) that passes through the 12 small circles, each of which is the diameter of the Moon, 2160 miles. There is said to be a converting factor with the verses of Revelation 21. The stadia is said to be the same measure as the furlong of 660 feet. Twelve thousand stadia converts to 7920000 feet. The breadth, length, and height are equal, so the figure becomes 4 x 12000 stadia or 48000 x 660 = 31680000 feet. Dropping the ending zeros, the basic figure is 4 x 12 = 48, and then, 48 x 66 = 3168. Diameter of Earth (across the 30th parallels) = 7,920 miles. Diameter of Moon (an almost perfect sphere) = 2,160 miles. 7,920 + 2,160 = 10,080 miles. = Length of perimeter of square around Earth. The radius of the large circle is the same number of miles as there are concentric rings in the circular city-state of Plato's Republic; 5,040. It is also the product of all the natural numbers from 1 to 7, or �7 factorial� (usually written 7!). As such it is seven times the value of the name Kallikrates. I am subscribed to your groups and have received your updates about something getting ready to happen maybe in Wisconsin. Well, this is just to say, I am a psychic who has been in very very close contact with my Guides for the last 15 years. I experience visions and/or dreams of things to come but also have done a bit of time traveling or remote viewing to events that have occurred and are about to occur. Today was a strange day, as I pride myself on being "grounded" even though I have this ability. Fortunately, like you, I have been able to deal with it and even are somewhat able to control what comes to me. I work as a medical transcriptionist at home, which means I am wearing headphones attached to my computer's speakers while I am working. This morning, I received a transmission of a very very odd sound that sounded to me like an electrical current coming through my head phones. There were no storms going on at all when it occurred. I panicked and took my head phones off real fast, thinking I was going to get some type of electrical shock, but it was okay after that. About a half hour later, while resuming working, I felt as though I had left my body, was very dizzy and disoriented and was felt I was leaving myself here. I totally panicked and put my fingers in my ears, thinking that would help my dizziness and it did. I then asked my Guides not to do that to me again as I felt that this was something occurring from them. I also have been seeing very vague visions that I really cannot describe, from maps with a huge black X, to visions of missiles in the air. But about 3 days ago, one vision was huge black letters on the front page of a newspaper which was exactly similar to the image I saw a few weeks before the Oklahoma City bombing on 04/19. I live in Oklahoma City and I have no idea what is going to happen but I just wanted to let you know, as an intuitive, I am definitely, most definitely picking up something very big getting ready to occur. I am wondering if this is related to several recent e-mail exchanges to other people, concerning the Pope, Nostradamus C2, Q97, and something happening on April 19th during the Pope's visit to the USA. I will paste the e-mail below. You will see the words, "when heaven and earth shakes," in the writing. The Pope was at a big event in "center field" yesterday, in a stadium in Washington D.C. In terms of symbolism, going back many years, I find this quite significant. Perhaps I will do a followup on that idea. << With the Scorpio Full Moon this weekend and the Sun moving into Taurus, this may prove to be quite huge and combustible. >> The verses about five months speak of stings from the scorpion. In the old days, Scorpio was represented by the Eagle, and associated with the Tribe of Dan, in the North quarter. Dan means judge. The Kabbalistic idea of North can relate to the upper regions of the Tree of Life, the eternal Olam. The following verse, Revelation 9:11, tells of Abad'don/Apol'lyon, the Angel of the bottomless pit, who has the key to open it. Some say this is Apollo, the Ravager of God. One of the young prophets spoke of this verse some months prior to 9-11-2001, in responding to another post about coincidences about 9:11. Rev 9:18 is also interesting, as it speaks of a third of mankind was killed. James Harrison, in "The Pattern and the Prophecy," connected the idea to the number 153, because it "resurrects" a third of all numbers via the sequence of adding the cubes. According to Blavatsky, Taurus relates to the death destruction creation process of the Kali Yuga. This is equated to a seed growing into a plant. The seed is destroyed in the process of the plant's growth. It sounds bad, but, at the end, it is quite positive. I doubt that any flower would choose to remain a seed! << Subj: Joe, the Eastern US is the 1st target . . .
<< That same morning, the normal buying of gas on my way to work resulted in me pre-paying for the gas, then asking gas attendant to activatePump#9. Then finding out, that pump #9 would not work. The gas attendant told me to leave pump#9 and go to pump#7. As I moved my vehicle, to pump #7 . . . I could feel a vision of a geography message coming into this scene. Upon arrival at work, this is when I started realizing that the moving from pump#9 to pump #7 was the Eastern time zone area. The dates, I believe, may indicate the Biblical number 153 by the five months between the April and September, and between May and October. The 21st day and number 21 are also important in meaning. From the April date to the one in October, there is an extra 30 days. The hours (720), minutes (43,200), and seconds (2,592,000) are key Gematrian numbers, especially cycle numbers. It's possible something is going on with the Pope. I wrote about it recently. I will paste part of it below. A "coincidence" happened recently, when I received an e-mail about the upcoming visit of the Pope this month. It was suggested that Nostradamus Quatrain 2.97 might apply. The coincidence was that the number 297 came up in my studies recently, and several unusual coincidences happened. It has been my experience that when the coincidences are strong and/or repeated in various ways, the track is on the money. I personally do not predict that the Pope will be killed or die in New York City on April 19th, but I do think it may be symbolic of the last Pope and the rise of the new Pope. The idea I have is that each of us will be our own Popes as our Higher (twin) Selves merge with us. Part of the point is that in the new Age, the "authority" will be with each person rather than church and state. I figure the church will have many more Popes, but in time, function of the Arrow of Death from the apex of power will be no more. To me, this is related to Zerubbabel making the great mountain into a plane in Zechariah 4:7. He is to be made the Signet Ring of the Lord when heaven and earth shakes (Haggai 2:20-23). The 144000 saved in Revelation 14.1 have this Father's Name (Tetragrammaton) written on their forehead. It also relates to Revelation 6:14, where every island fled away and no mountains were to be found. To me, this means there is a "level playing field," and thus no apex of power. This also relates to Isaiah 65:17, 21, 22, where the new heaven and new earth are created. We will each plant our own vineyard and build our own houses (as Zerubbabel started the foundation of the house in Zechariah 4:7). As I composed the recent e-mail, I realized that C5:Q31 speaks of the "bridge ruined," and "subjected, a wreck amidst the waves," in addition to the rose. To me, the bridge is the Pathway between HOD and NETZACH, which is assigned the Tower Card. It is the third chakra. The 9-11 events indicated the symbolism of that Card. We seem to be at the "Crossroads." The number 297 came up in my work lately, including strange coincidences, so Quatrain 2.97 perked my interest in your post. Also, several years ago, we did an article about the next Pope (near the last), based on a dream and prophetic material. You and Norma are mentioned in the article, as it relates to the Hanged Man Tarot card. The number 297 came up in working with mirror numbers. It is the mirror of 792, which is a harmonic of the Earth's diameter of 7920 miles. I will place various links below for anyone interested. In the new article about the squares of the mirrors, there is a table with the two-digit types. The most common result is 297 or a multiple. The number 396 (half of 792) is also major. The number 396 is also one of the "Solfeggio" numbers. Some related numbers are on the Music Wheel, based on 440 tuning and crop circle ratios, including, 297, 396, 528, 792, 3960, 5280, and 7920. People researching the Solfeggio numbers have found that the central "C" note, when tuned at 528 cps, has a healing effect on DNA. "Coincidentally," 528 does show up at that very place on the Music Wheel. The ancient system, as Munck and others have reported, included the 5280 foot mile. By that time, I knew that 792 was a harmonic of Earth's diameter, and that Gematria means "measuring the Earth." Around 1994 a snail mail corespondent, Paul Rydeen, had a dream where he was billed $7,920 for damaging a Ford Falcon. Flight 11 hit one Tower. Flight 175 hit the other. Flight 77 hit the Pentagon. Flight 93 crashed in Pennsylvania. A movie was paying at the time, "U-571," which is about finding the solution to a secret code under the water. Another movie playing was "Ocean's Eleven." The number 93 is Crowley's New Aeon. The number 39 showed up in a very important crop circle and it is 3 x 13 or 2 x 19.5. Simple two-digit mirrors feature number 9, while the squares of the two-digit mirrors feature the number 99. Simple three-digit mirrors also feature 99. It did not escape me that the number 99 is 9 x 11, which could well be part of the number symbolism of the 9-11 events, possibly hinting of mirror numbers. I just now realized that 1965 can also be reduced to 21 and then 3 (21 relates to 2001). The number 33 is featured in the Music Wheel, as 11 marks on each side of a triangle. The number 153 is the Biblical "resurrection number" found in John 21, as the number of Fish in the Net. The numbers 1 through 17, of course, add to 153, indicating it is a "triangle number." The Biblical story features Peter, who is said to have become the first Pope. Who to the Romans will not be too agreeable. This prediction came true when Pope Pius XI served from February 11, 1922 to February 11, 1939, i.e., 17 years to the day (or close to it according to some). Some say he was murdered. The one elected at the same time is apparently the present Pope, Benedict XVI. He was elected on a date that seems to appear repeatedly, 19 April 2005. As you pointed out, Waco happened on that day in 1993 and Oklahoma City in 1995. I think it is also significant that he is the 265th Pope. That number is part of the Fish in the Net story, as the measure of the little diamond shapes in the Net are 153 by 265. Did Pope Benedict choose to be number XVI as a reference to the 16 diamonds of the Net? Whatever . . . all this stuff is sooooooo strange to me! The Fish in the Net story features the Seed of Life, which fits with the sixth sphere of the Tree of Life. Perhaps Nostradamus saw the two bodies of water on either side of Manhattan and thought they were rivers. This seems somewhat like the third secret at Fatima. BTW, the apparitions of Mary were over a period of six months (actually five months in duration), from May 13 to the Dance of the Sun on October 13, 1917, which adds up to 153 days. A well researched book came out a few years ago, "Heavenly Lights: The Apparitions of Fatima and the UFO Phenomenon," that presents major evidence that the Fatima events were much like ET events. The rose is said to be the Western Lotus, and thus related to the chakras. My major theory, based on dream-coincidence, is that the big change is related to the sixth sphere of the Tree of Life, Tipharet. The "Seed of Life" is a symbol for that sphere during the time cycle in the lower three chakra levels. Tipharet represent the fourth chakra, the Heart. 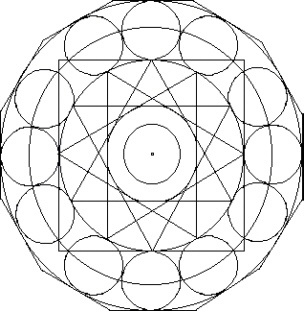 The Seed of Life opens like a flower-aperture, to reveal the Star of David inside, with the twelve-petal flower outside, the traditional symbol of the Heart chakra. One could say that the rose (chakra) will bloom or flourish. Will be subjected, a wreck amidst the waves. Oh boy, a big part of the meaning just became clear to me this moment. The "bridge" clearly seems to be the "dumbbell" path connected between the two spheres just below the sphere of Tipharet, as the entire "dumbbell" represents the third chakra, symbolized by The Tower Tarot card. Oh, yes, that bridge was ruined on 9-11 as the great towers fell. Some of this was featured in our 1997 article about the Tree of Life Crop Circle. The upper part of the Tree of Life is like the "Attic," and Tipharet the Rose, is up there. The idea about the "bridge" meaning came to me via dreams and other events, such as bridges collapsing. In some dreams it is an overpass above a highway or roadway, or a stream. << The Nostradamus quatrains are of great interest to me. "a wreck amidst the waves." Heaven. I believe it was Blake or Dante. waves, or the third wave. and we seldom recognize them. Square is a 6 x 6 gird with the numbers 1 through 36 within. (reduces to 11) day of the year, with 111 days remaining. circle at Crooked Soley near the end of August 2002. It was a six-fold representation of mitochondrial DNA. and the pattern is made up of 1296 �curved squares�. miles. The perimeter of the box is 4 x 7920 = 31680.
or Pyramid Pi is used, which is 22/7. 3960 + 1080 = 5040.
stadia or 48000 x 660 = 31680000 feet. 48, and then, 48 x 66 = 3168. 31680 = 6 x 5280 or six miles in feet. the square root of three (5280 = 88 x 60). I gathered many of these ideas via reading T. J. Earth is considered Hell in some traditions. who's kingdom has be stolen. and they shall plant vineyards, and eat the fruit of them. long enjoy the work of their hands." with seven lamps. This is Joshua and Zerubbabel. for three days and a half (the midpoint of the chakras). four Letters of the Divine Name, the "Father's Name"
cycle ends at 11:11 AM Universal time, but I think not! I have more to say, but I have run out of gas. tank. That has not happened much lately. The site of Clifford's Tower, the keep of York's medieval castle, still bears witness to the most horrifying event in the history of English Jewry. On the night of 16 March 1190, the feast of Shabbat ha-Gadol, the small Jewish community of York was gathered together for protection inside the tower. Rather than perish at the hands of the violent mob that awaited them outside, many of the Jews took their own lives; others died in the flames they had lit, and those who finally surrendered were massacred and murdered. 587 THE STRANGE COINCIDENCE ? Now this was just 2 months after 9/11. Let�s take a look at the synchronicity of 587. Once again I repeat. As far as synchronicity is concerned, either God does it or people purposely do it. We find the prominence of the number 777 in Kaballah which is the mystical part of the Jewish Religion. 265 people were killed in the crash of Flight 587. 265 is a measure of the Net in the 153 Fish story.